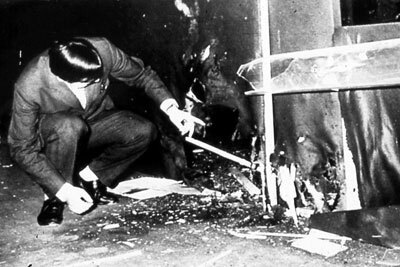 DURING THE Festival of Liberation of 25 April 1969, there was an explosion on the FIAT stand at the Fiera campionaria in Milan. It was nearly 7.00 pm and 20 people were injured, though none of them seriously. Shortly before 9.00 pm. a further explosion occurred in the Central Station at the bureau de change of the Banca Nazionale delle Communicazioni — again, fortunately, with few people injured. No lives were lost, but that was only by luck. Both bombs had been activated by a timing device. Figures released the Interior Ministry stated that these terrorist attacks had been preceded by 32 other attacks. By the end of the year the number of explosions and arson attacks stood at 53. But other sources counted as many as 140. Why the disparity? Because only those attacks for which someone had been denounced or arrested made it into the ministry’s figures. Attacks by persons unknown were not included in the official statistics. 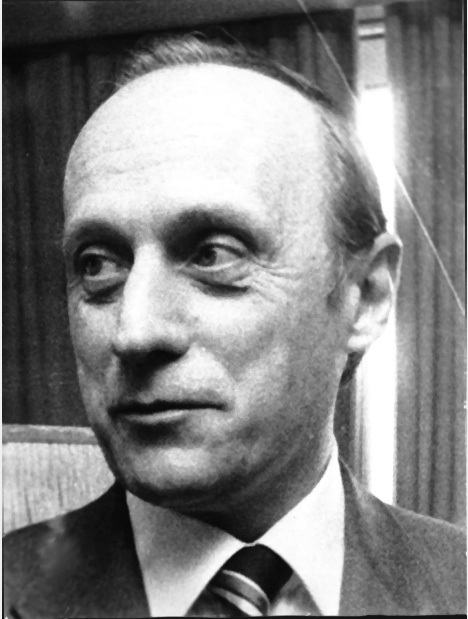 In the case of the 25 April bomb attacks (with their echoes of the partisan war and ‘leftwing’ targeting of those standard-bearers of Italian capitalism, FIAT, and Italian financial institutions), there was a trio on the job that was to become famous by the end of the year — Inspector Luigi Calabresi, his superior Antonino Allegra and Judge Antonio Amati. All three took off on the anarchist trail. 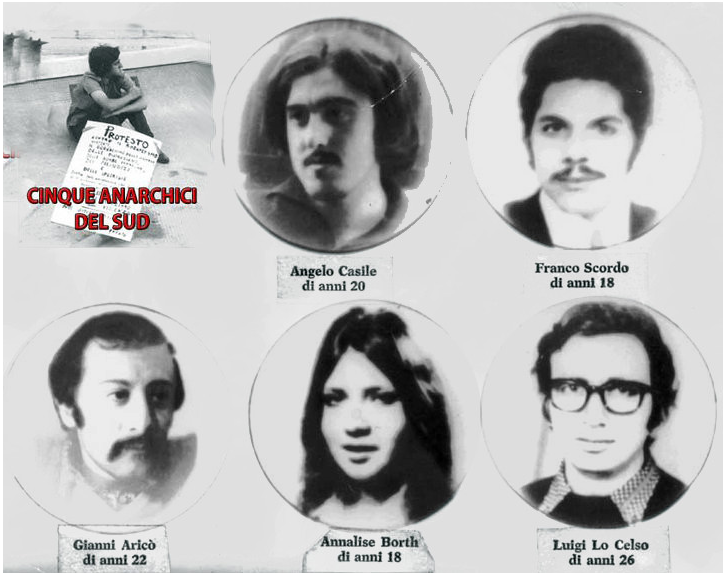 They rounded up fifteen anarchists, of whom they detained four — Paolo Braschi, Paolo Faccioli, Giovanni Corradini and his wife Eliane Vincileone. Whereas the first two were very young and virtually unknown in leftwing circles in Milan, Corradini and Vincileone enjoyed a certain renown. 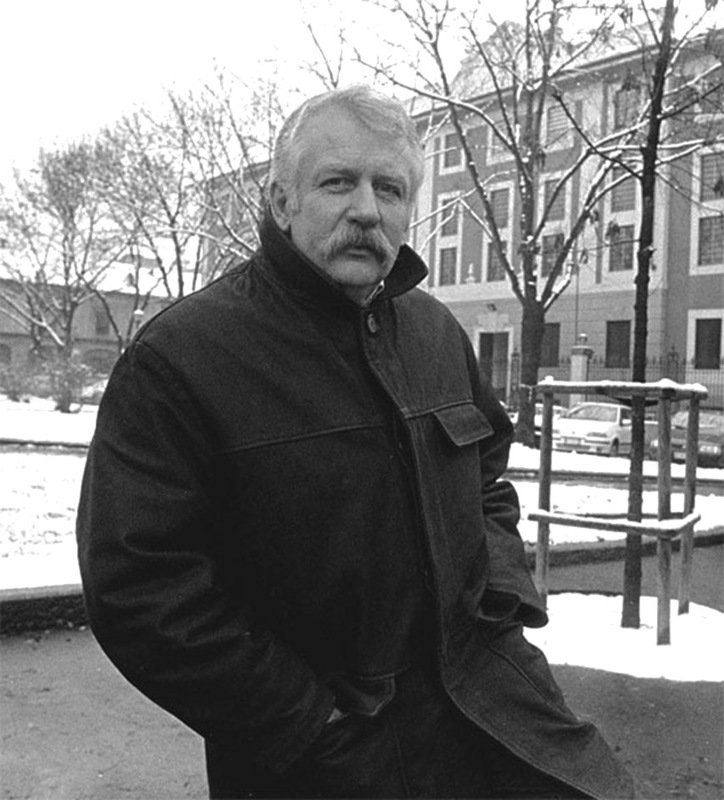 He was an architect and both had a wide circle of acquaintances. 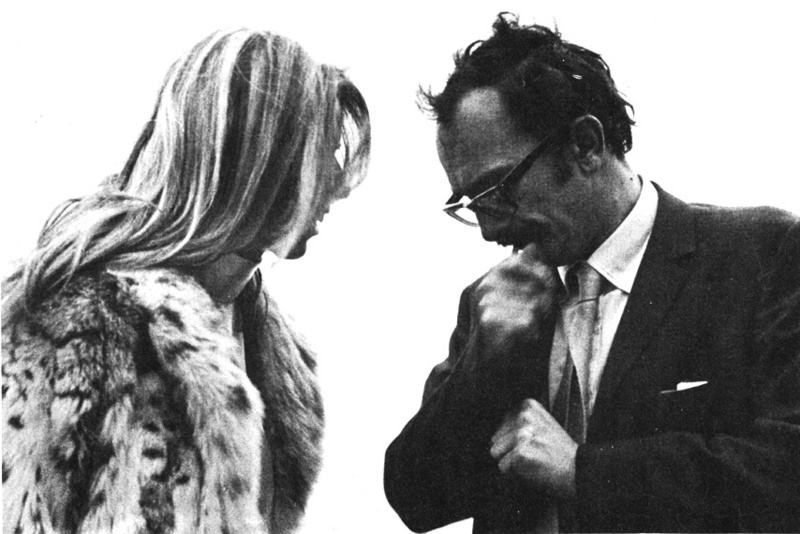 They were good friends, indeed, of the publisher Giangiacomo Feltrinelli and his fourth wife Sibilla Melega. 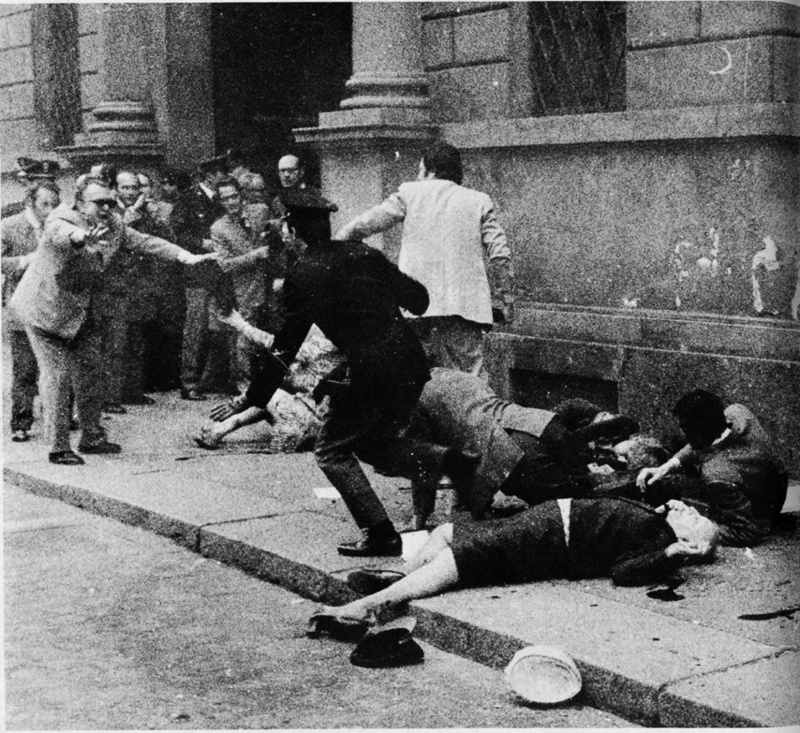 This led to Corradini and Vincileone being depicted as the organisational brains — the masterminds — behind the attacks. 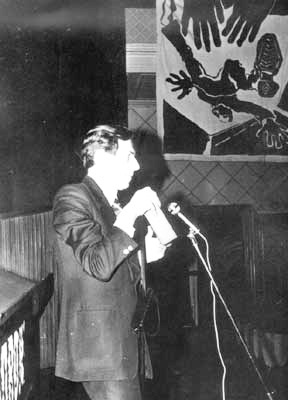 Corradini was regarded by the Special Branch as an anarchist theorist because, in 1963, he had been in charge of running the monthly Materialismo e libertà, a paper deemed to have broken new ground in anarchist circles, but one that had been short-lived, running to only three issues. 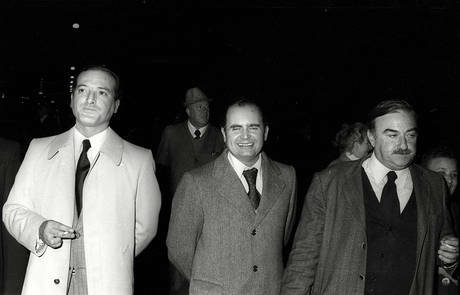 In addition to this foursome there was also Angelo Piero Della Savia, who was extradited from Switzerland, and Tito Pulsinelli who was picked up in Riccione on 22 August. 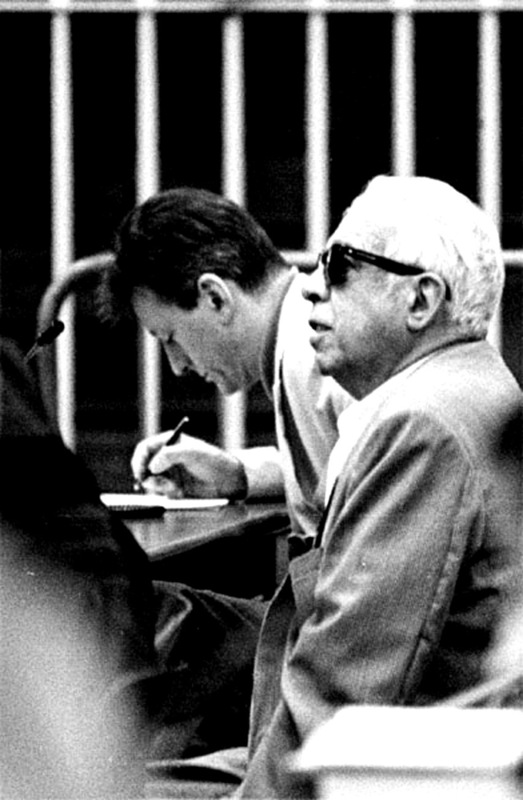 Pulsinelli was arrested with Enrico Rovelli who was, however, soon released. He dropped out of the investigation and joined the ranks of Inspector Calabresi’s informants. 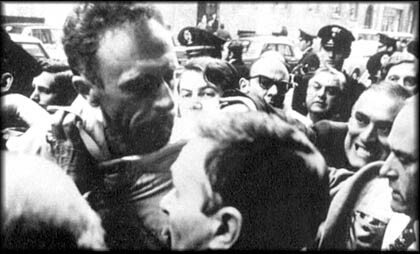 His role was finally exposed during the inquiries into the attack carried out outside police headquarters in Milan by Gianfranco Bertoli, an individualist anarchist, on 17 March 1970. Rovelli turned up a year later, still at large on the streets of Milan, as the organiser of big rock concerts and manager of the celebrated Rolling Stones Club on the Corso XXII Marzo. 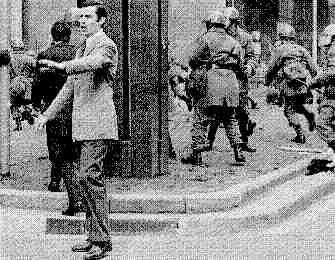 17 May 1973: Bertoli's arrest outside Milan police headquarters (Questura). 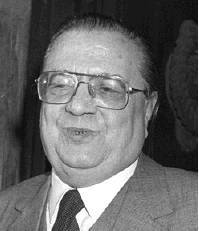 The reason he gave for the attack was to settle accounts with interior minister Mariano Rumor whome he blamed for the murder of Giuseppe Pinelli. The anarchists were charged with both 25 April bomb attacks (conveniently, this occurred three days after the parliament was due to debate draft legislation on disarming the police and which, in view of the climate at the time, was set aside) and of another 18 lesser offences. The anarchists allegedly confessed to a number of the latter offences, but consistently rejected the charges relating to the 25 April bombings. When it came to court, they retracted their ‘admissions’, stating these had been extorted by Inspector Calabresi. 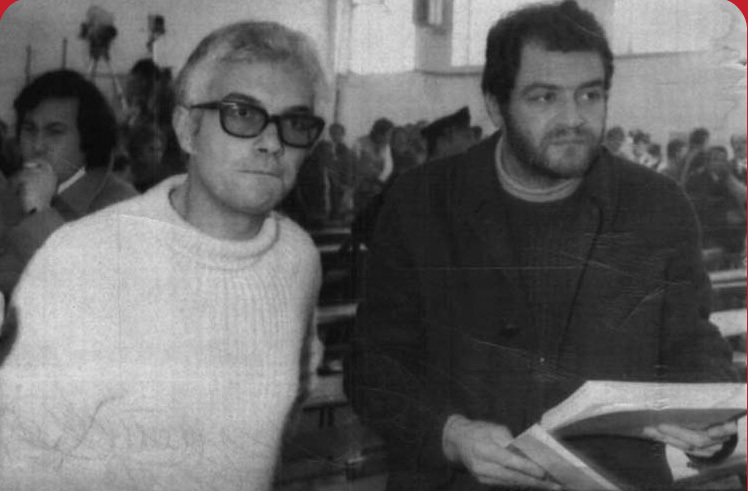 Corradini and Vincileone were freed from prison on 7 December 1969 due to lack of evidence and their alibi having been confirmed by Feltrinelli and Melega, (although the latter were indicted for perjury, a charge that was to collapse when it eventually came to court). 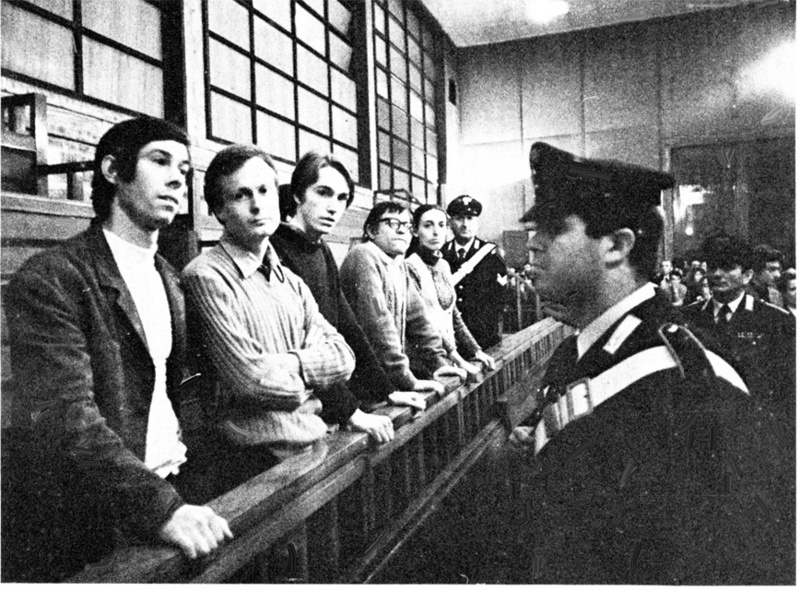 The trial opened on 22 April 1971, nearly two years after the initial arrests. The accused were cleared of the Fiera campionaria and Central Station attacks on 28 May, after 36 sittings, but were convicted of six of the minor attacks. The sentences handed down were: Della Savia — eight years: Braschi — six years and ten months: Faccioli — three years and six months. The Court of Appeal later reduced these sentences in April 1976. Pulsinelli was cleared of all charges. The trial ended with a substantial repudiation of the inquiries made by Inspector Calabresi and of Judge Amati’s examination. 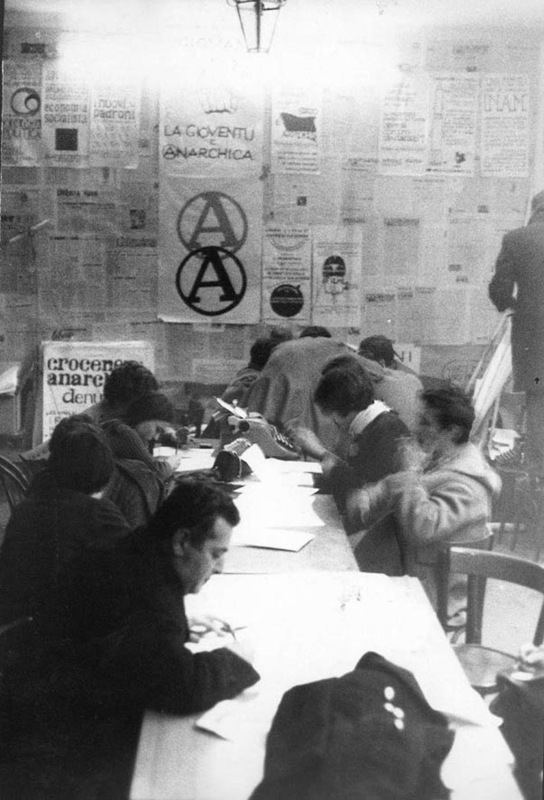 The charges brought against the anarchists relied mainly upon two witnesses, that of Rosemma Zublena and another whose name was to crop up again — ballistics expert Teonesto Cerri. Cerri, by contrast, stuck to his accusations by alleging theft of explosives from a quarry in Grone — a theft that had never been reported and which those in charge at the quarry denied had ever taken place. Yet, flying in the face of all reason, the jury confirmed the theft from the quarry. Why? — to justify the sentence handed down for the six minor offences and, incidentally, to show that Valpreda could have had explosives in his possession. 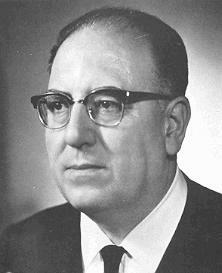 Even more seriously, however, the court chairman, Paolo Curatolo, ignored a document published at the beginning of December 1969 in The Observer and The Guardian newspapers in Britain. International experts had pronounced the document reliable. 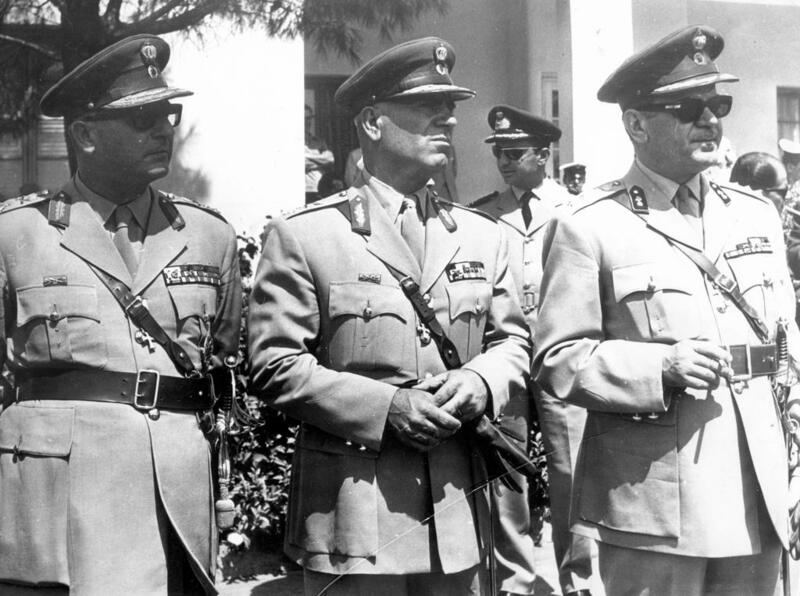 This was a secret memorandum addressed to the Greek Foreign Affairs minister in which premier Giorgios Papadopoulos was briefed on the results of a provocative campaign mounted in Italy by the Greek government over some time — with the connivance of fascist groups and “some representatives from the army and the carabinieri.” The report speculated about the chances of a rightwing coup d’état through an escalation by action groups that had been in operation for some time past. 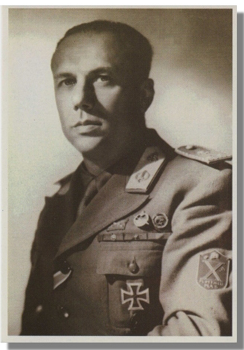 The 3-page dossier assessed the activities of Luigi Turchi, a Movimento Sociale Italiana (MSI) [principal fascist party] deputy and by an unidentified Mr P. It read: “Only on 25 April was it possible to mount the actions scheduled for earlier. The alteration to our plans was forced upon us by the fact that it was hard to gain access to the FIAT pavilion. Both actions have had a considerable impact.” The other action had been the Central Station explosion. But then another even more sensational development occurred. 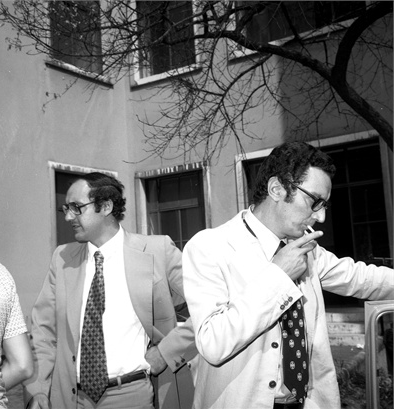 On 13 April 1971 — a few days prior to the opening of the proceedings in Milan — Giancarlo Stiz, the examining magistrate in Treviso, issued warrants for the arrest of Giovanni Ventura, a 27 year old publisher and bookseller from Castelfranco Veneto, Franco Freda, a 35 year old prosecution counsel from Padua and Aldo Trinco, a 28 year old student. Judge Stiz accused them of conspiracy to subvert and ‘procurement of war materials’ but also — above all— of planning bomb attacks in Turin in April 1969 and on the state railways in August 1969. 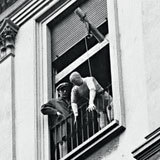 Freda and Ventura would later be sentenced to 15 years in 1987 for these outrages and for the 25 April 1969 bombings in Milan. However, there was one worrying detail with regard to this matter. 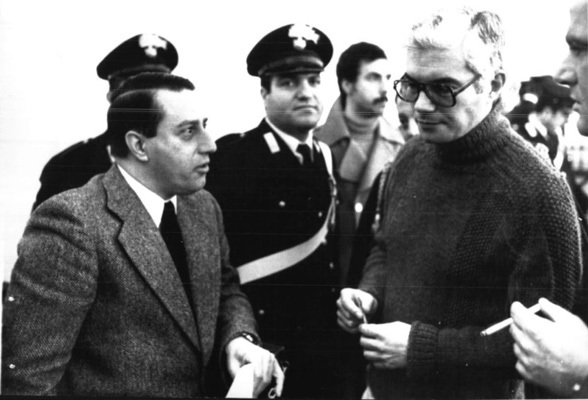 Gianni Casalini of the Padua Nazi group (and an SID informant code-name Turco) had told the secret services he had driven to Milan with an Ivano Toliolo, a confidant of Freda’s, who had brought with him a bag containing explosives. 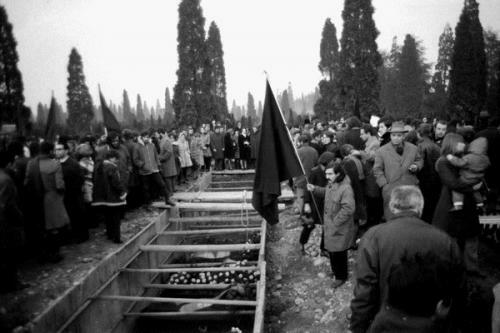 But Gianadelio Maletti, director of the SID’s D division (counter-intelligence), decided to bury this information. What happened in August 1969? 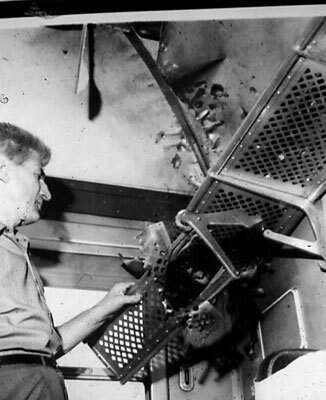 Ten trains travelling between Northern and Central-Southern Italy were targeted by eight bombs, which exploded between one o’clock and three o’clock on 9 August — another two failed to explode. Twelve people, passengers and railway employees, were injured. The cost-benefit outcome for the perpetrators was certainly not favourable. 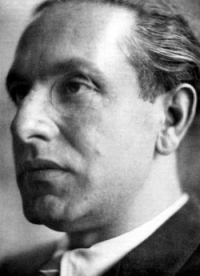 A lot of logistical effort had been deployed (the bomb on the Pescara-Rome train had needed the direct involvement of Freda and Ivan Biondo, also from the Nazi group in Padua) even though the desired effect was not produced. A climate of alarm was created, but no life had been lost. Investigators Allegra and Calabresi again headed down the anarchist trail. 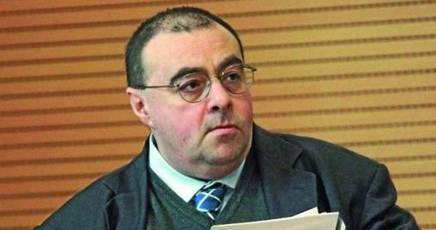 Allegra, the head of the Milan Special Branch, put this allegation to Giuseppe Pinelli who laughed in his face. On that occasion, too, August 1969, the press ran with the police misinformation. On 13 August La Stampa carried a piece by-lined g.m. entitled ‘Anarchists have gone to ground to escape questioning’. Notwithstanding back up from the press, the police in several cities failed to arrest or charge anyone — but the climate was right for a clampdown on extremists. And so, in Milan, at dawn on 19 August, 150 police and carabinieri forced their way into the former Commercio hotel, now rechristened the Casa dell student e del laboratory. The building, due for demolition, was in the Piazza Fontana, directly opposite the Banca Nazionale dell’Agricoltura branch. 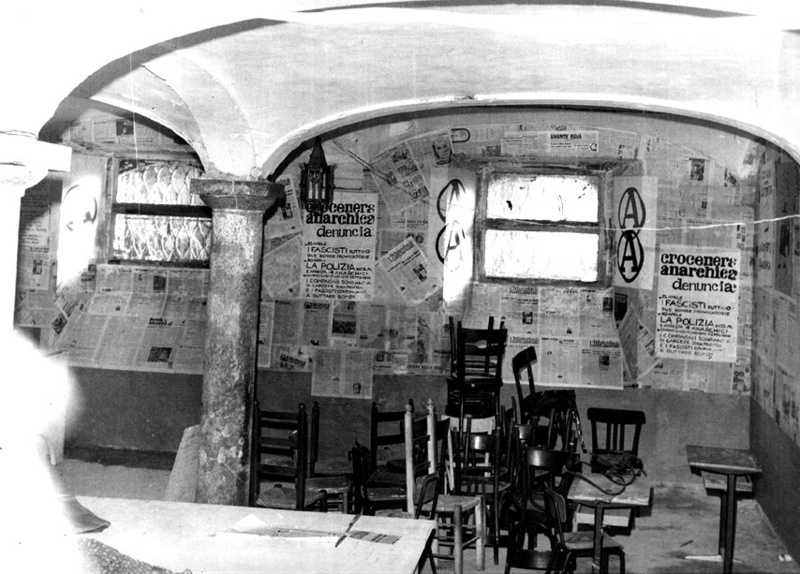 Squatted after a student meeting on 28 November 1968, the premises had become a regular meeting-place for the far left: the newspapers described it as ‘a headquarters of Maoist and anarchist contestation.’ The police burst in on 58 sleeping people who were rounded up for identification. Three were arrested and released on 22 August. Immediately after the police forced entry, a demolition team went into action and within hours the premises had been reduced to rubble. This was the opening paragraph of an article published on the front page of the Corriere d’Informazione of Wednesday 17 December 1969, over the by-line of Vittorio Notarnicola. 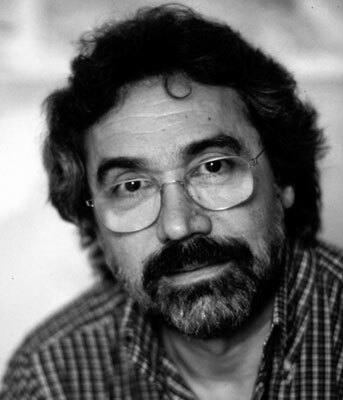 The editor was Giovanni Spadolini who was adding this job to his post as number one at the Corriere della Sera. 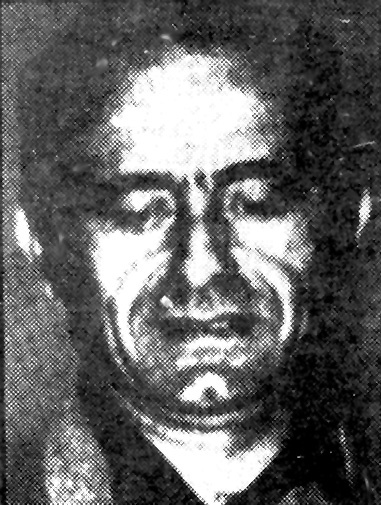 Two large photos — one of the taxi-driver Cornelio Rolandi and a photo of Pietro Valpreda overshadowed the article. The bold capitalised headline read: ‘VALPREDA DONE FOR’. The morning papers that day, formally less sensational, took a clear line, albeit with some circumlocution. They accepted Valpreda’s guilt unreservedly. 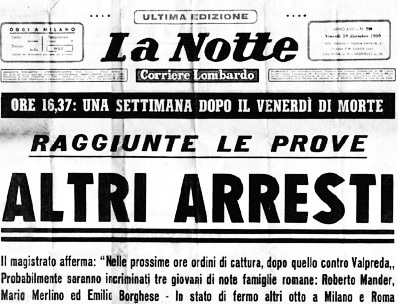 Corriere della Sera proclaimed: ‘Anarchist Valpreda arrested for collusion in the Milan massacre’. La Stampa opted for: ‘Anarchist arrested for colluding in massacre. Inquiry into suicide at police headquarters in Milan’. Il Giorno went for ‘Charged with massacre’. L’Unità chose: ‘Arrest made for massacre’. Avanti! 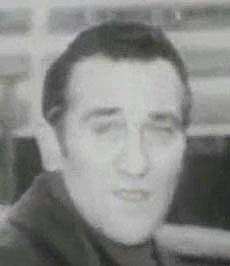 : ‘Arrested for collusion in massacre’. 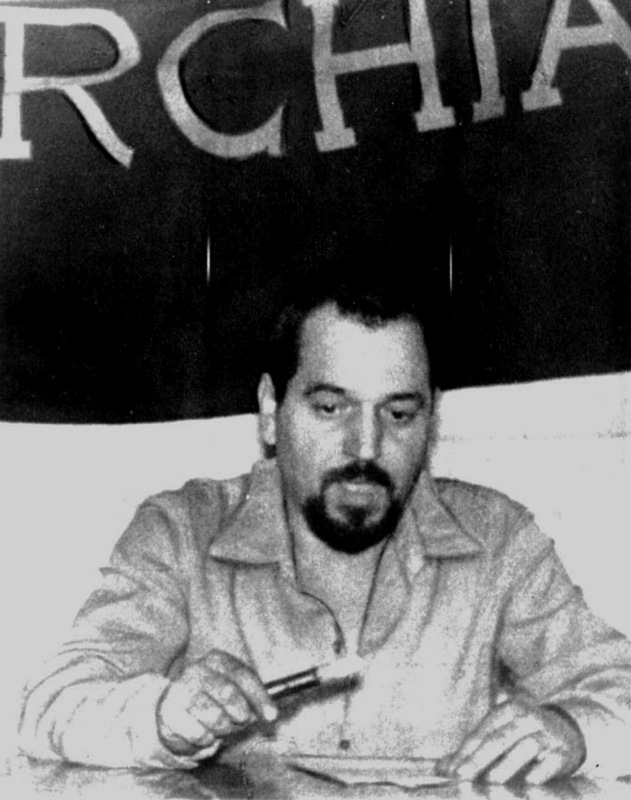 Il Resto del Carlino declared: ‘An anarchist arrested for massacre’. Il Messaggero went for: ‘Criminals arrested’. 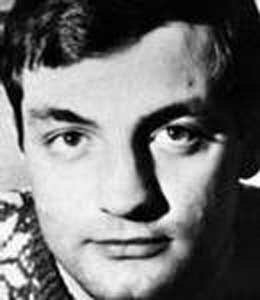 Il Tempo: ‘Murderer arrested: anarchist Pietro Valpreda’. Paese Sera opted for: ‘Man identified by cab-driver reported for colluding in the massacre’. 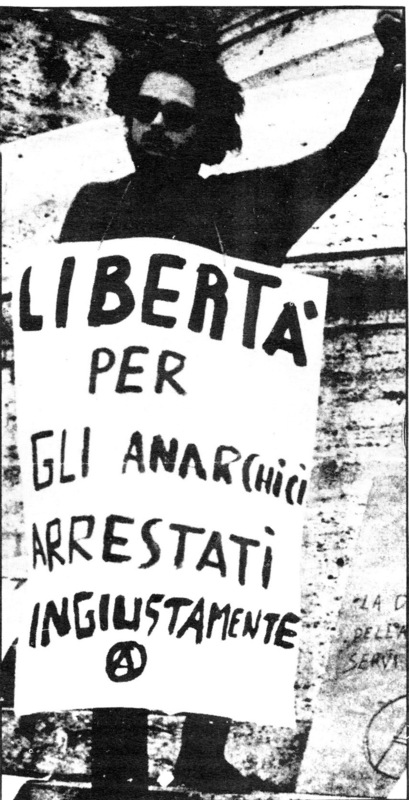 Il Popolo: ‘Anarchist arrested over Milan massacre’. Il Mattino plumped for: ‘Terrorist who carried out massacre arrested’. 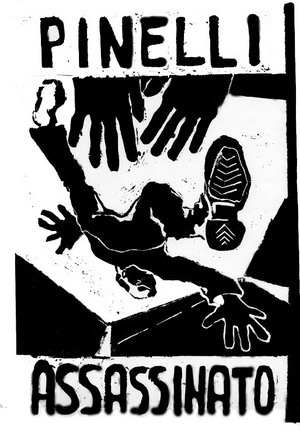 Roma: ‘Arrested: the monster is an anarcho-communist dancer from Canzonissima’. So it looked as if the file could be closed. The police had tracked down those responsible in record time. The sole basis for these accusations was the taxi-driver Cornelio Rolandi’s statement — and it was barely credible. At 4.00 pm. 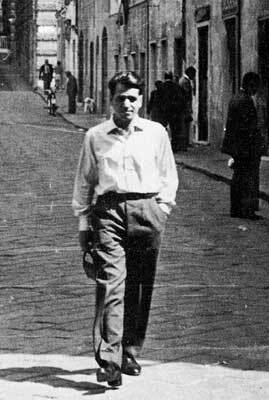 on 12 December, Rolandi was in his Fiat 600 in the Piazza Beccaria when a customer asked him to take him to the junction at the Via Santa Tecla. When they arrived the fare asked Rolandi to wait while he got out, carrying a black bag. He returned after a few minutes and they drove to the Via Albricci where Rolandi dropped him. Anyone familiar with Milan city centre will find this strange. The taxi rank in the Piazza Beccaria is 135 metres from the entrance to the Banca Nazionale dell’Agricoltura. It is 117 metres from the Via Santa Tecla to the bank. In order to spare himself a journey of 135 metres, Valpreda allegedly made a return trip 234 metres, with the added risk of possible recognition by the random taxi driver he asked to make the trip. 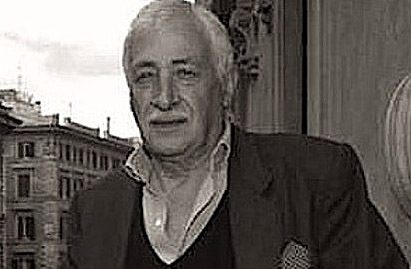 This is how Rolandi remembered that afternoon: ‘the guy with the bag boarded my taxi in the Piazza Beccaria; he was clutching a black bag in his hand. 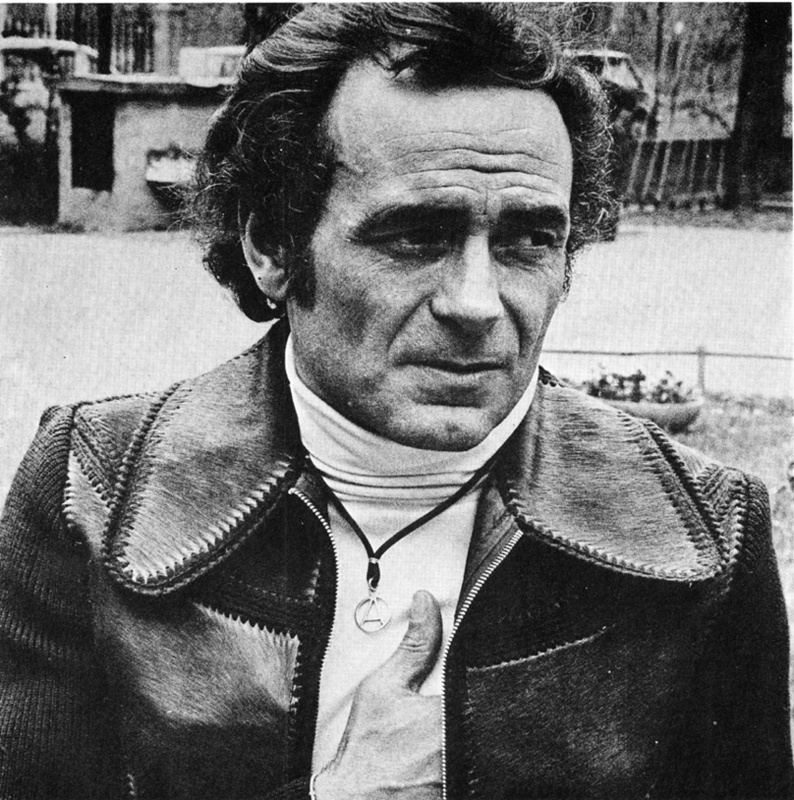 I looked at him in the rear-view mirror and spotted right away he had the long sideburns in fashion these days. He asked me to drive him to the Via Albricci via the Via Santa Tecla. The trip was quite a short one, but in the Via Albricci there are lots of airline offices. I thought he might be a passenger off on a flight. I stopped in the Via Santa Tecla, as requested by the fare. I said that the Via Albricci was not far away and that he could walk it, but he told me to wait as he was pressed for time. Off he went with the bag. He returned after a short time, but without the black bag. 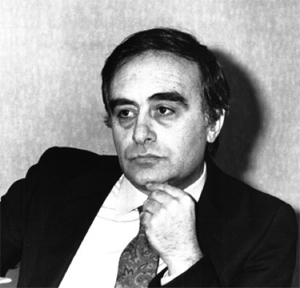 I drove him to the Via Albricci where he paid the 600 lire fare and left.’ (Franco Damerini, ‘Intervisto a Milano con il teste-chiave’ in Corriere dell’Informazione, 17 December). ‘To the best of my recollection, this is the story told to me by the taxi-driver. It was about 4.00 pm. on 12 December. I was in the Piazza Beccaria when I saw a man of around forty years of age entering the Piazza Beccaria from the Galleria del Corso. He came up to me in flawless Italian with no regional accent and: “Banca dell’Agricoltura in the Piazza Fontana.” I replied: ‘But the Banca dell’Agricoltura is only a few steps away — 50 metres away, signore. 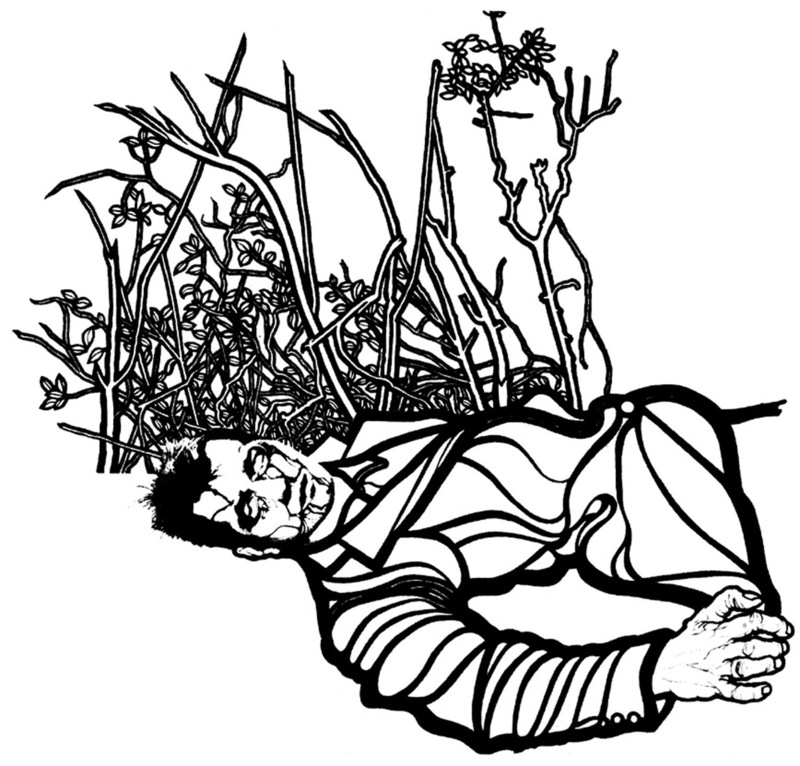 You’d be better off walking it.“ He said nothing, opened the door and stepped into the taxi. I had a good view of him. He was carrying a briefcase, a fat briefcase that appeared very weighty. Off we drove to the Banca dell’Agricoltura, within five or six minutes. He got out of the taxi, walked briskly into the Bank and came out equally briskly within 40 or 50 seconds, a minute at most. He got back into the taxi and he said: “At this point Paolucci interrupted asked him why the man would be coming from the Galleria del Corso. Rolandi’s response was priceless: “Don’t you know that the Galleria del Corso is a notorious hangout?’ A claim he repeated three times. These were not the only contradictions Paolucci mentioned. There was another witness too — a very important one. This witness insisted that Valpreda was in bed sick on 12 December. Who was it? 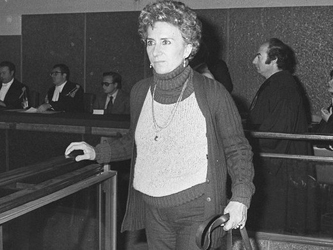 Valpreda’s great aunt Rachele Torri who lived in the Via Vincenzo Orsini in Milan. This was how the great aunt remembered that afternoon: ‘Pietro was in bed with a fever. He was about to fetch the overcoat that he would need the following morning if he were to keep his appointment with Judge Amati. Well, I went instead. It must have been 7.00 – 7.30 pm and I remember that as I was boarding the E bus in the Piazza Giovanni dalle Bandere a lady opened a copy of La Notte and I caught sight of some headline about deaths. I asked her if there had been an accident and she replied that there had been bombings. I got off in the Piazza del Duomo and cut through the Via Dogana to catch the No 13 tram to Pietro’s parents’ place in the Piazza Corvetto. I stopped at the newsagent’s and bought a copy of La Notte. When I arrived at my niece’s flat I told her that Pietro had arrived, ill, which was why I had come to fetch his overcoat. Pietro’s sister, Nena, urged me to get him to eat something and gave me the overcoat and some shoes. I then went straight home and told Pietro his sister had asked him to eat something. 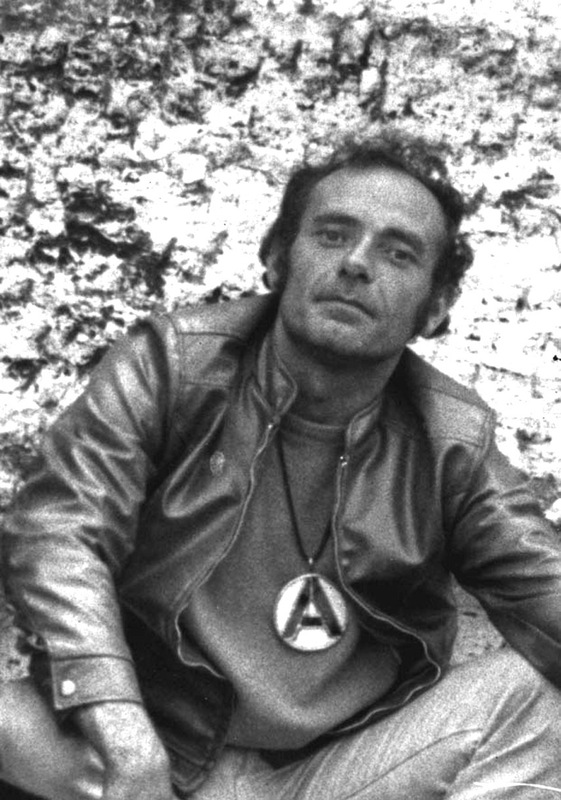 Then I gave him the newspaper.’ (Interview with Rachele Torri in Rivista A— Rivista Anarchica of February 1971). 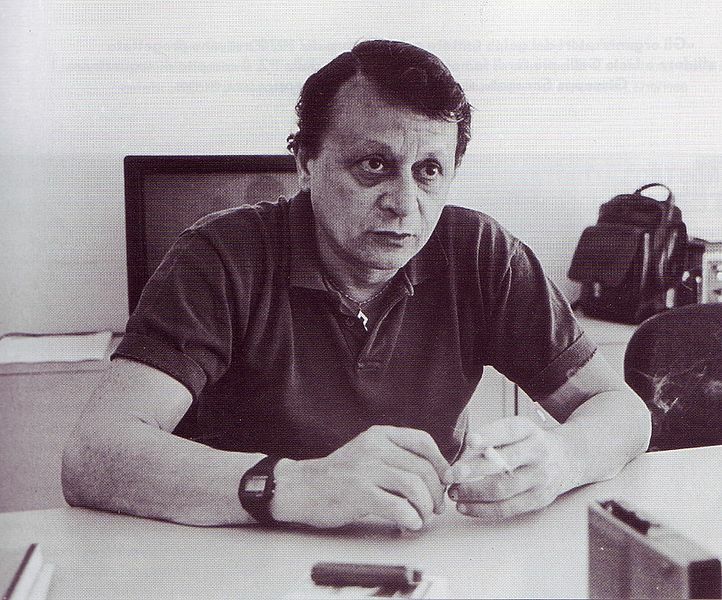 The next day, 13 December, Valpreda met with his lawyer Mariani and went with him to a meeting with Judge Amati. The judge was not available so they left him a note saying Valpreda would call again on Monday the 15th. He then made his way to the home of his grandparents, Olimpia Torri Lovati and Paolo Lovati in the Viale Molise, where he remained until the morning of 15 December. His sister, Maddalena and girlfriend, 33-year-old Elena Segre, a translator who lived in an apartment block in the Viale Lucania where Valpreda’s parents lived, called to see him. Segre dropped by to see Valpreda at around 6.00 pm. on Sunday the 14th. 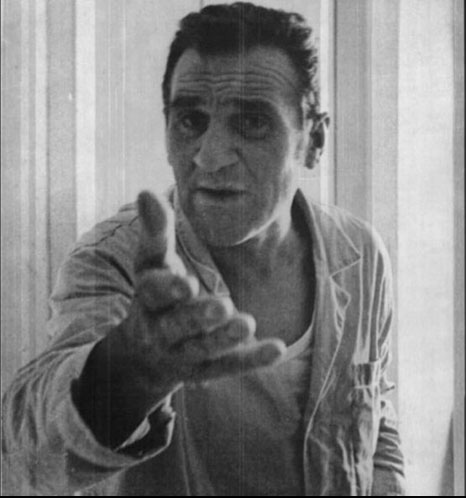 In an interview with Giampaolo Pansa in La Stampa on 18 February 1970, Segre stated: ‘Pietro was here at his grandparents’ place. I rang the bell and they let me in. He was on the settee pushed against the wall over to the left, wearing blue pyjamas and he got up to meet me…’ Pansa interrupted to remind her that her evidence had already been taken by Ernesto Cudillo, the examining magistrate, and by Vittorio Occorsio, the public prosecutor and that therefore if she told lies they could arrest her. So Valpreda had an alibi for the days from 12 to 15 December — alibis that showed he could not have been in the Piazza Fontana and contradicted his incredible taxi trip. By that time it was hard to argue Valpreda was guilty. But the police and magistrates had certainly not acknowledged defeat. 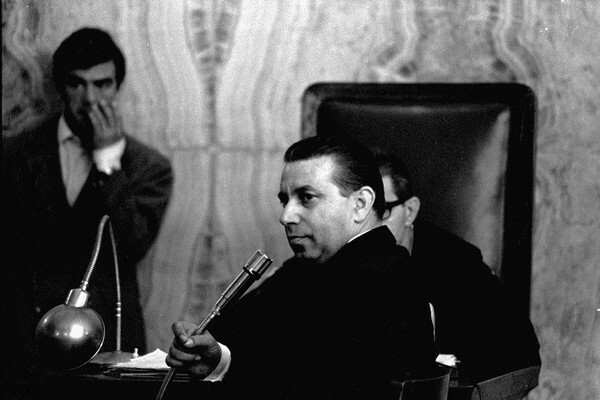 And so, a little over a month later in early February 1970, they brought out a few Roman witnesses to testify that Valpreda had been in Rome on 13 and 14 December. If Valpreda’s relations were telling lies about those two dates, then they had lied about 12 December too and so the taxi driver Rolandi’s testimony would stand. Who were these witnesses? 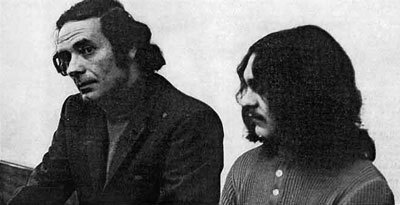 Ermanna Ughetto, stage name Ermanna River, Enrico Natali, Gianni Sampieri, Armando Gaggegi and his wife and Benito Bianchi — all avant-garde theatre folk who appeared regularly at the Ambra-Jovinelli theatre in Rome. But when Valpreda was brought face to face with these witnesses on 6 March, there were clearly two conflicting versions of events. The Roman witnesses claimed to have met in Rome Valpreda on 13 or 14 December. Valpreda argued that the meeting they referred to had taken place about ten days earlier — shortly after Valpreda had been released from the Regina Coeli prison on 25 November. 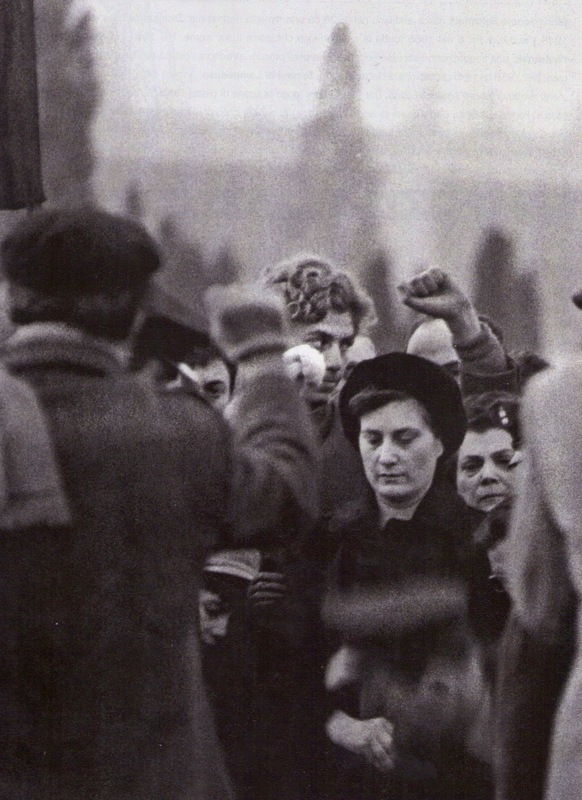 In fact, Valpreda had been arrested on 19 November following a fracas with fascists in the Trastevere district. But there was another detail. 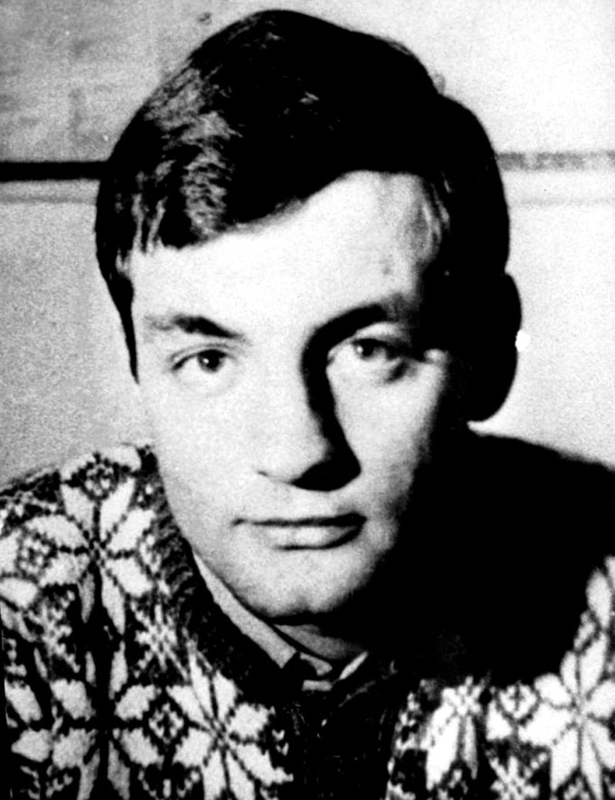 During a medical inspection prior to his entering prison, Valpreda had bruising around his left eye, bruising that had cleared up by the time he was arrested on 15 December. 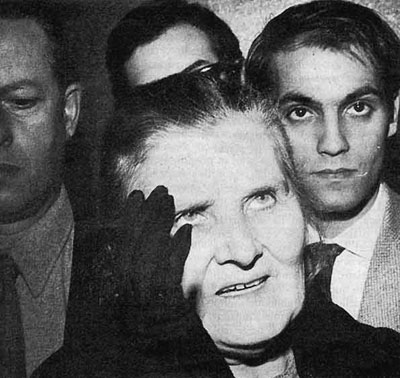 Some of the witnesses remembered the bruising when they claimed they had met Valpreda after the Piazza Fontana massacre. This was another contradiction that does not appear to have raised doubts in the minds of Cudillo and Occorsio, who indicted Valpreda’s relatives for perjury. Inexplicably, though, no action was taken against Segre who made the same claims. 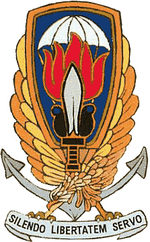 To add to the charge sheet, on 7 February Benyamin Safari from Milan police headquarters stated that the bag containing the unexploded bomb in the Banca Commerciale Italiana contained a piece of stained glass similar to that used by Valpreda in the manufacture of his liberty lamps. An unforgivable oversight by the anarchist bomber. According to the police, the discovery of this incredible evidence dated back to 2.00 pm. on 14 December 1969, but nobody spotted the coloured glass until February. 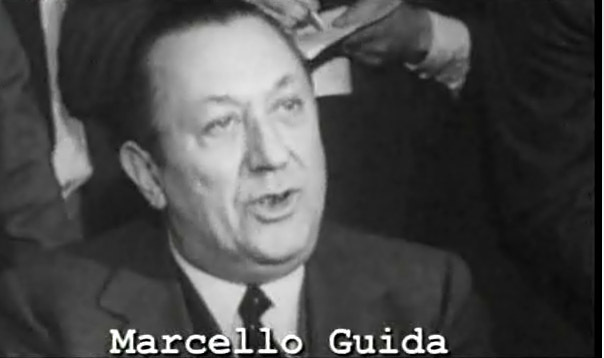 Valpreda’s defence counsel, Guido Calvi, was easily able to cast doubt on this “heaven-sent” discovery. 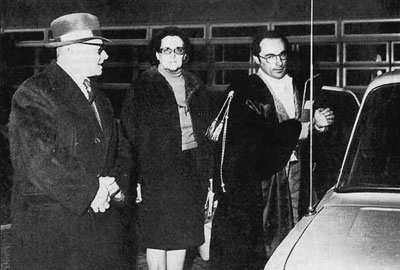 As the judges saw it, Valpreda arrived in Milan in his Fiat 500 on 12 December. At 4.00 pm. 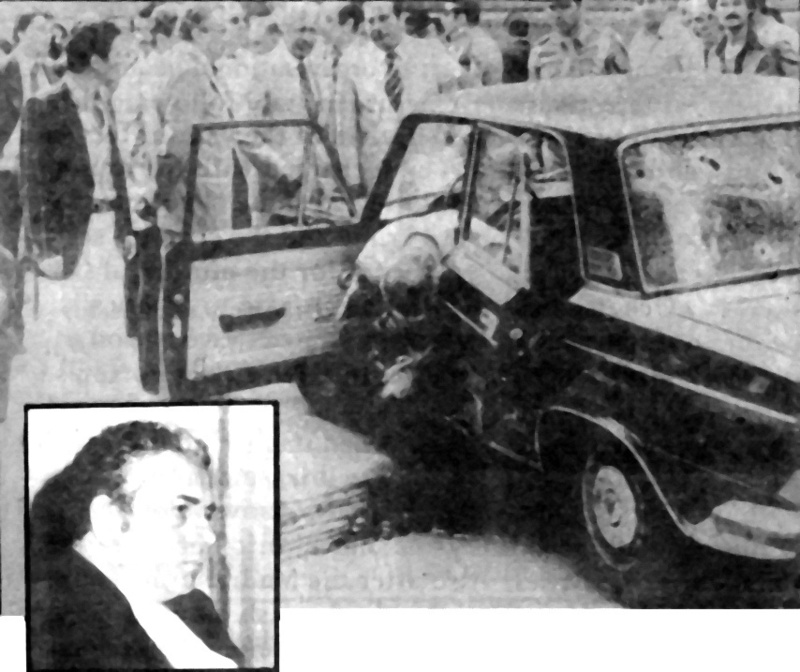 he took a taxi to plant his bomb in the Piazza Fontana. 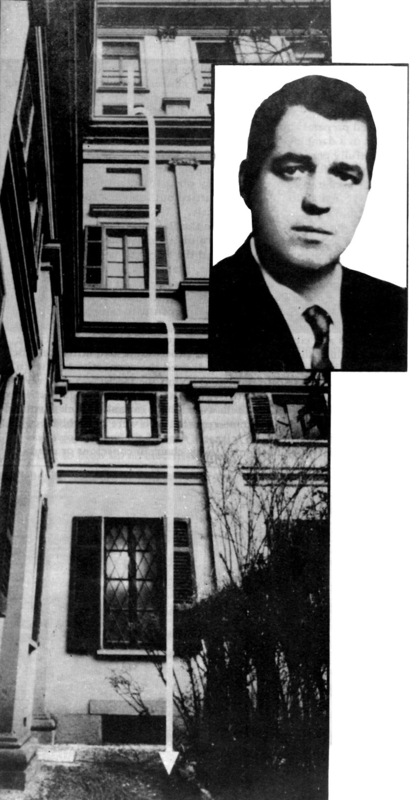 On the morning of 13 December he accompanied his lawyer Mariani to see Judge Amati. He failed to find him and left a note to say that he would return on 15 December. Then he left for Rome in his beaten-up Fiat 500. That evening he bumped into the dancer Ughetto and went to dinner with her. 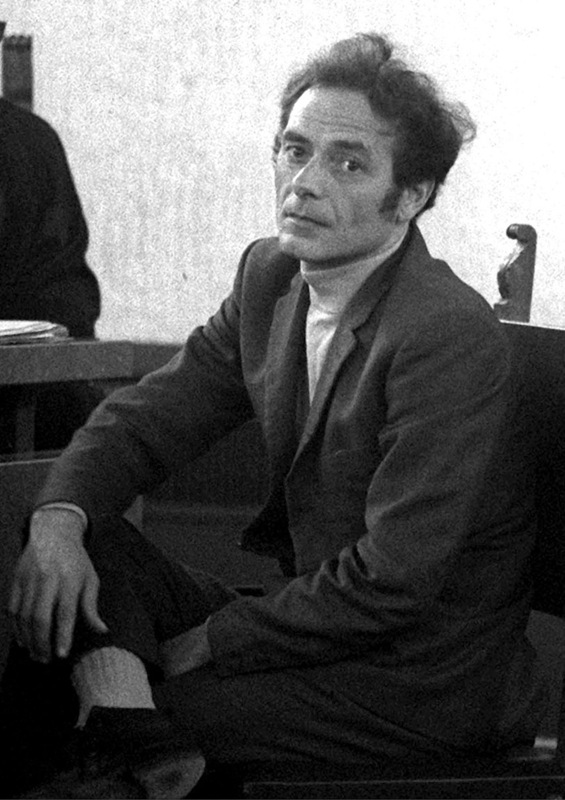 On Sunday 14 December he was back in the bar near the Ambra-Jovinelli theatre where he was seen by others who would be able to give the lie to his alibi. He was still in Rome as of 9.00 pm. By 8.00 am the following day he was back in Milan with his lawyer. Technically, using a different car perhaps, this was feasible. But it defies belief that Valpreda would have put together a false alibi that could so readily be rebutted by so many people. Just as it defies understanding why Valpreda’s relatives and his girlfriend Segre, with whom he had not spoken at the moment of his arrest, were able to confirm what Valpreda had said. Cudillo and Occorsio had a different version of the truth — Valpreda was guilty. Not only was he a liar, but his parents were also lying. 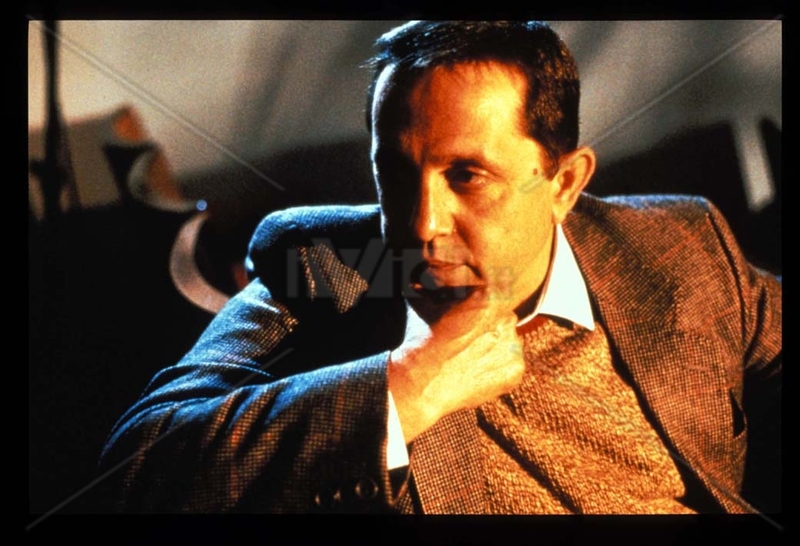 Especially when Rolandi was telling the truth and was in for the 50 million lire reward from the Interior ministry. 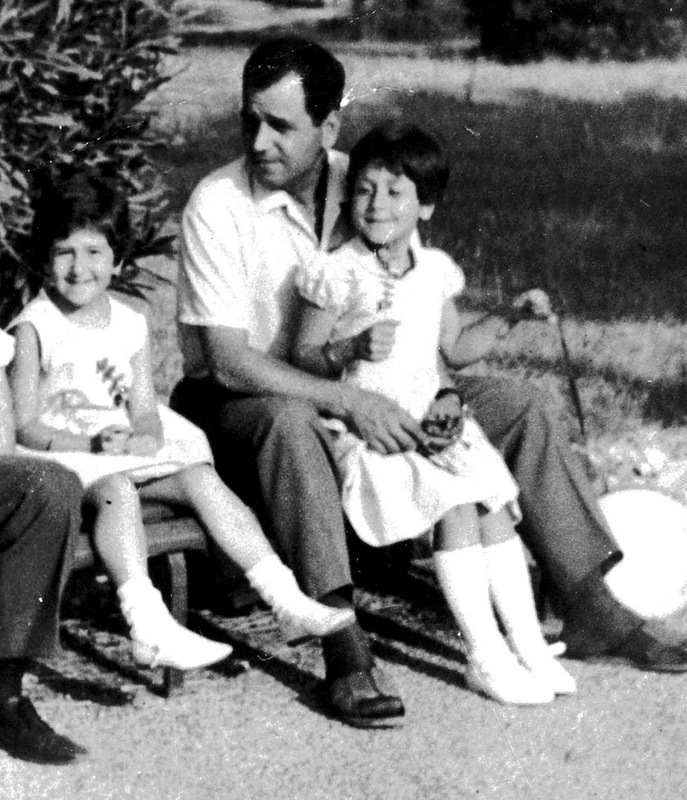 Cudillo and Occorsio made sure this truth was written into the record in an interrogation ‘for future use’; perhaps they foresaw Rolandi’s death on 16 July 1971. 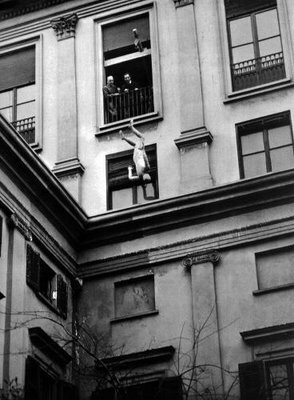 “THEY’VE THROWN Pinelli from a window at police headquarters. Let’s demonstrate in the Via Fatebenefratelli and have ourselves arrested. 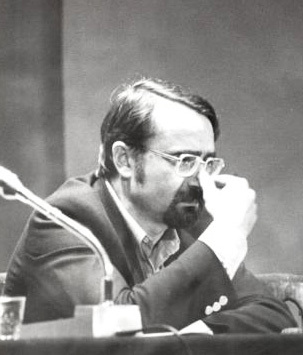 They’ll have to push us all out of a window to silence us”, Amedeo Bertolo told Luciano Lanza (the author) in pained but excited tones over the phone. That was shortly after 7.00 a.m. on 16 December. The grapevine was set in motion. Everybody was alerted. I was stunned, but I threw on some clothes and was out of the house within minutes. 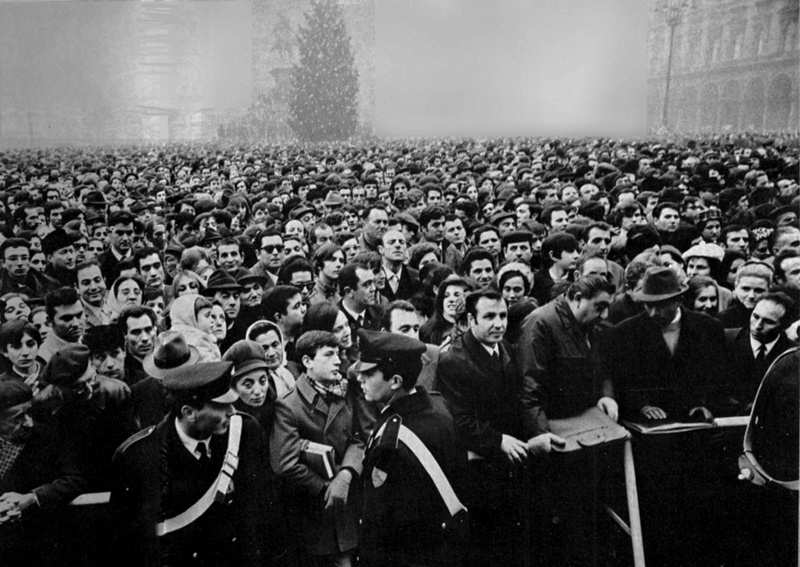 I lived in the Porta Venezia area so I cut through the public gardens into the Piazza Cavour and made my way on foot towards police headquarters in the Via Fatebenefratelli. There were no anarchists to be seen yet. I waited. The minutes dragged by. Nobody. Then I realised that a few people, almost certainly plain-clothes police officers, were staring at me. I tried to appear unfazed, although it was not easy. I waited. 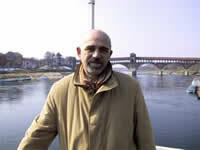 After nearly an hour, although it seemed like hours, I saw Enrico Maltini from the Ponte della Ghisolfa group arrive. We waited for the others so we could all go inside together and surrender ourselves to the police. Our intention being to make a political issue out of it, but nobody else had shown up. We were beginning to feel uneasy. The police had all but surrounded us. “Let’s make a phone call”, Maltini suggested. 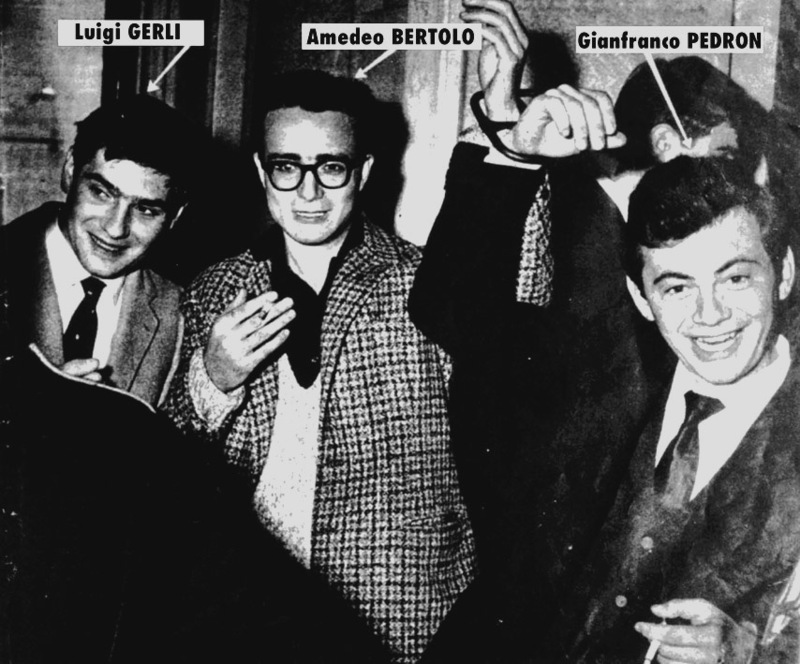 He rang Bertolo, whose wife, Antonella, answered and all but shrieked at us: “They arrested him on the stairs”. That immediately sparked a round of phone calls to the others. But the lawyer was mistaken and by the early hours of that afternoon nearly all the detainees had been released. While he was being held at the local police station in San Siro, Amedeo Bertolo heard one police officer call out cheerfully: “A dog has died. One dog less to worry about”. 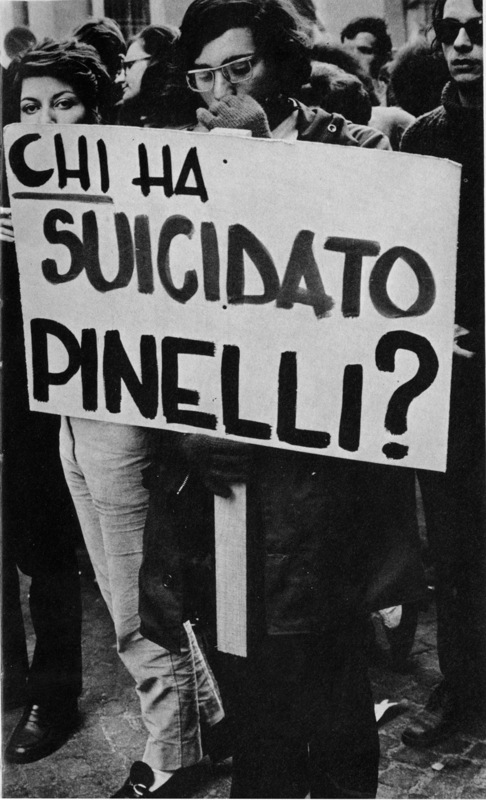 It was a reference to Pinelli. Not that the other detainees received any better treatment — their alibis were checked out and there were threats and bullying. But in the end all were released. 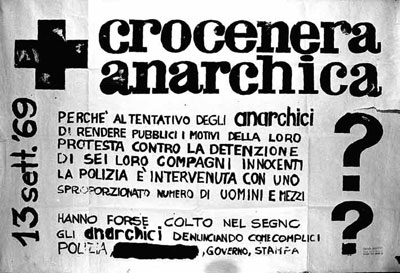 And so another flurry of phone calls called the anarchists to meet at Conca del Naviglio, near the Circolo in the Via Scaldasole. 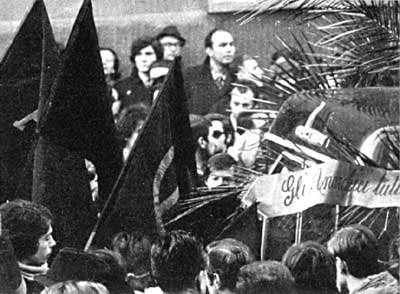 At that point another anarchist arrived: “The students are holding a rally at the State University to decide on their response to Pinelli’s death.” One of those present undertook to deliver the press statement to the ANSA agency (it was ignored by every newspaper) while the others decided to move on to the State University. 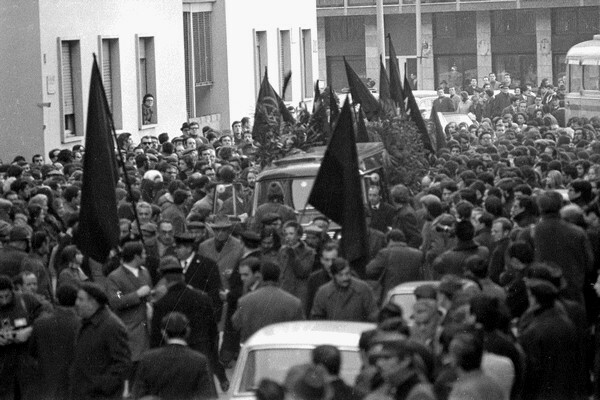 But when they arrived there was a surprise waiting for them: the students had already assembled for a meeting — to discuss study plans, not repression or Pinelli’s death. One of the student leaders, Andrea Banfi, told the dumbfounded anarchists that the gathering was about to break up and that they could address it, if they wished. Nearly an hour later, I took the floor. I read out our statement and stressed the gravity of the situation. Moves were afoot to trigger a backlash that would damage the most radical trade union movement and the revolutionary left. 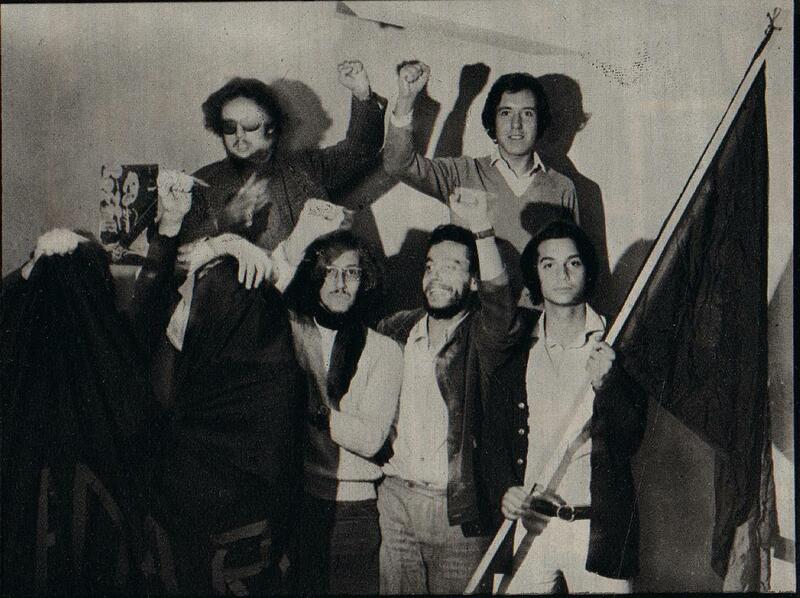 Suddenly, Banfi, Salvatore Toscano and Popi Saracino, three student leaders, intervened. Later they claimed to have been the first to waken up to the “fascist danger”.